Zimbabwe’s President Emmerson Mnangagwa arrived in Harare late Monday after cutting short his fund-raising trip in order to address the country’s economic crisis and crackdown. Zimbabwe police have charged the leader of the country’s largest labor union with subverting the constitutional government. The lawyer for Japhet Moyo, the secretary general of the Zimbabwe Congress of Trade Unions said he has been charged with subversion for his role in organizing last week’s national strike that the government said degenerated into riots. The protests prompted the government to launch a sweeping clampdown in which 12 people were killed, according to human rights organizations. More than 600 people were arrested. Zimbabwe’s High Court has ordered Zimbabwe’s government to restore full internet to the country. The court ruled that the government’s shutdown of the internet was illegal because the Minister of State for Security, who ordered the internet closure, does not have powers to issue such a directive. The court said only President Emmerson Mnangagwa has the authority to make such an order. Zimbabwe’s government closed the internet for much of last week. Over the weekend it restored partial internet, but kept a blackout on social media apps like Facebook, Whatsapp and Twitter. A spokesman for Zimbabwe’s largest trade union said police have arrested the secretary general of the Zimbabwe Congress of Trade Unions, Japhet Moyo. He was arrested at the airport in Harare on Monday and lawyers are checking with police to see why. His organization had called for last week’s nationwide strike to protest the government’s action to more than double the price of fuel. The strike and protests sparked off a government crackdown in which 12 people were killed, according to human rights groups. More than 600 people, including opposition members of parliament, have been arrested in connection with last week’s protests. The labor federation called for last week’s job stay away. Zimbabwe’s capital is returning to normal Monday, after a week of turmoil in which Zimbabweans protested dramatic fuel price hikes and government security forces launched a crackdown in which 12 people were killed. Most shops and businesses have reopened, although many people are stocking up on food items in case the country faces further unrest. President Emmerson Mnangagwa is expected to return to the country late Monday, after announcing Sunday that he will skip attending the World Economic Forum in Davos, Switzerland. He is in Kazakhstan, after visiting Russia last week. Zimbabwe’s courts are on Monday to hear two cases related to the government’s ongoing clampdown on dissent. The High Court will hear a challenge to the government’s suspension of internet services. Although internet service has been restored after a nearly week-long blackout, social media outlets such as Facebook, WhatsApp and Facebook are still jammed. 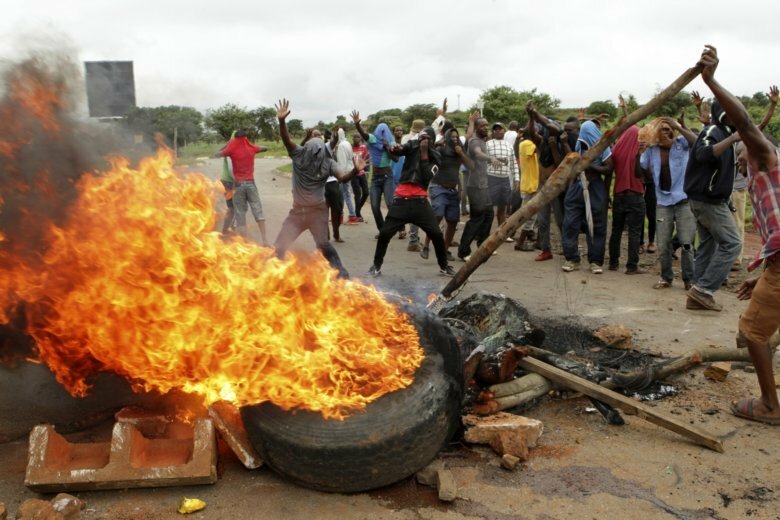 The government has said its action is to prevent Zimbabweans from organizing violent protests. The blockade “has caused serious inconveniences, loss of business and income, threats to life and the right to health care as people are not able to access vital communication relating to their medication,” said the court application by Zimbabwe Lawyers for Human Rights and the Media Institute of Southern Africa, which urged the court to rule that the government should lift its restrictions. In a separate court case, the lawyer for activist and pastor Evan Mawarire is trying to get him released on bail. In jail since Wednesday, he has been charged with subversion against the government for which he faces 20 years in jail if convicted. Mawarire had used social media to support peaceful protests against the fuel price increases. The case against Mawarire is a “travesty of justice” said his lawyer, Beatrice Mtetwa. In the widespread crackdown, more than 600 people have been arrested of which more than 400 have been denied bail, said Mtetwa.